Snap(shot) Judgements are posts that will appear with no real regularity. It’s primarily a way for us to get thoughts and photos up as soon as possible, especially when we have no plan to write a feature-length column on the subject. 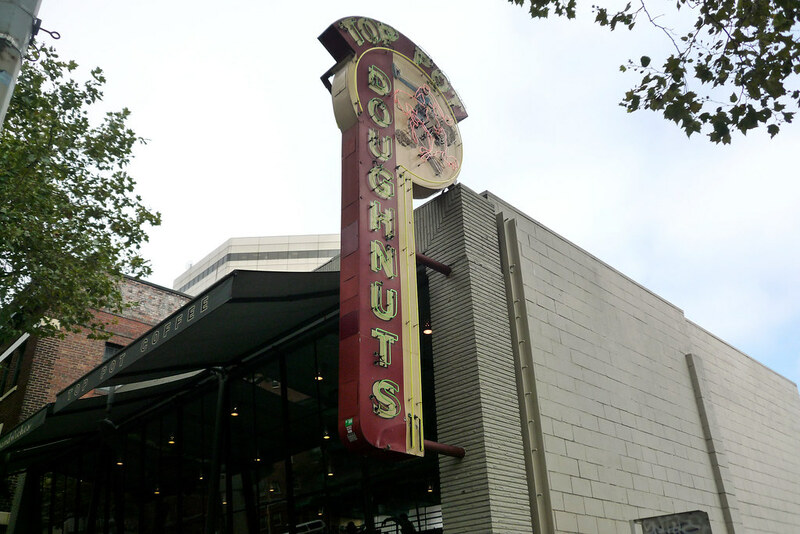 Here, Gary starts his morning off with some delicious doughnuts at Top Pot Doughnuts. Ah, doughnuts, the deep fried dough delicacy that never fails to make me happy. There’s no better way to start the day than with a nice, chocolate frosted doughnut and a cup of coffee. So on my first morning in Seattle, that’s exactly what I did, making the one mile walk from my hotel over to Top Pot Doughnuts. Was it worth the long walk and the subsequent time spent in line? Hell yes. The doughnuts here are really well crafted, especially in the case of their special doughnuts – the chocolate frosting had a nice, shiny sheen atop the cake doughnut and the raspberry old fashioned was a tart, crispy treat. So, yeah, if you ever find yourself in the Seattle area, look for these doughnuts.